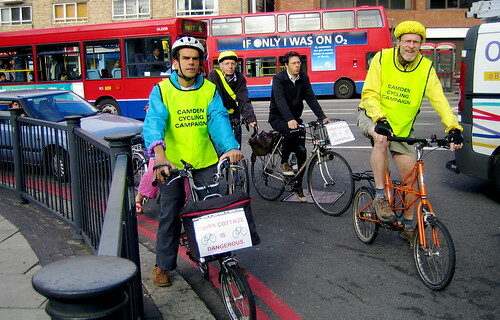 TfL is consulting on a scheme for “improvements” on the gyratory which do absolutely nothing to address the fact that this is probably the most serious barrier to cycling in Camden. Seven of us rode round the island from 8 am to 8.30 am when the traffic was heavy. We gave out a few leaflets pointing out the dangers for cyclists where drivers are busy looking for an opportunity to change lanes themselves and appear to be unaware of the cyclists who have to share the road with them. E.g. cyclists riding north from Avenue Road to Finchley Road need to cross over 4 lanes of traffic twice to complete the manouevre. Ironically, there are two “London Cycle Network” signs beside the road on the way round the island. The best solution would be for the roads return to their original two-way operation. But while the gyratory remains, a single traffic lane on Avenue Road (outside the Library) should be sacrificed in order to provide a two-way segregated cycle track. Sadly, just as we had stopped circulating, we witnessed an incident involving a cyclist who was southbound on Avenue Road when a motorist cut across in front of her and she had to brake hard and went over her handlebars. Her injuries were not serious but she was taken away in an ambulance. 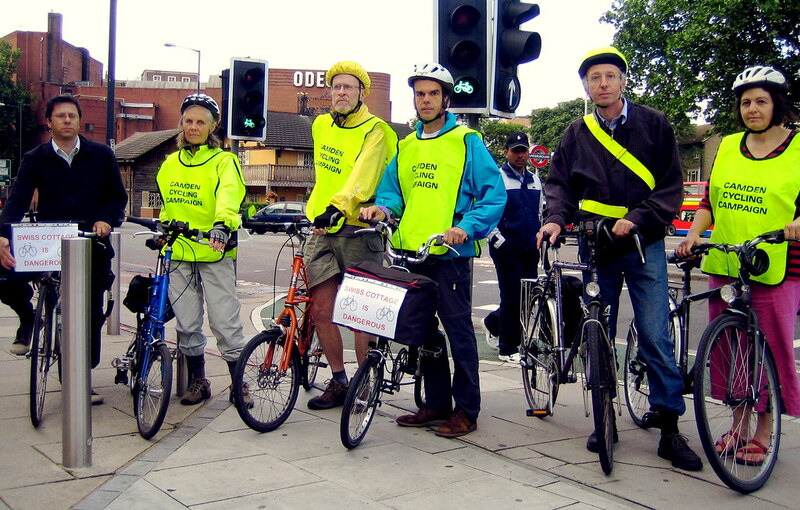 We were pleased to be supported by Ben Tansley coordinator of Brent cyclists.